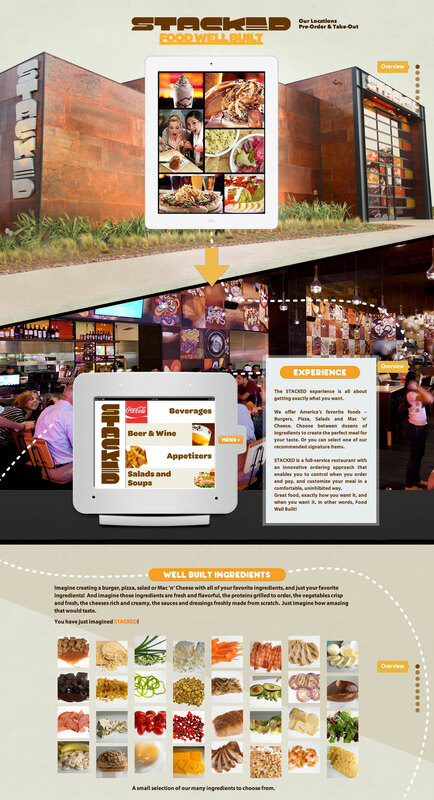 A lot going on in this colorful One Pager for “Stacked” restaurant chain. Stacked was looking to build a professional appearance with a new and exciting look to revitalize their web presence. With the deadline fast approaching, ZehnerGroup had 3 short weeks to complete the task as well as ensure it's operation on the iPad and other mobile devices. ZehnerGroup also had to show the breadth of the restaurant, from it's 100's of ingredients to it's growing community, in one cohesive layout. Stacked made a big impression and won the first annual "Operator Innovations Award" at the National Restaurant Association conference in Chicago. The 2012 W3 Gold Award winning design has been getting a lot of recognition while through an engaging experience for visitors and potential customers.